I covered the walnuts with alcohol in August last year and let them rest for almost 8 months (you can probably do with less, especially if you quarter the walnuts). I then removed the walnuts and added spices, lemon and sugar. After two days I removed the lemon wedge and approximately one month later I filtered off all the spices. As you can see from the pictures below the filter easily clogged. Using normal coffee filters I had to change them roughtly 4-5 times for each batch. I let the filtered nocino rest for some more weeks and then carefully decanted it into a glass bottle, leaving the newly set residue behind. If desired the nocinos can be diluted with water and/or vodka. 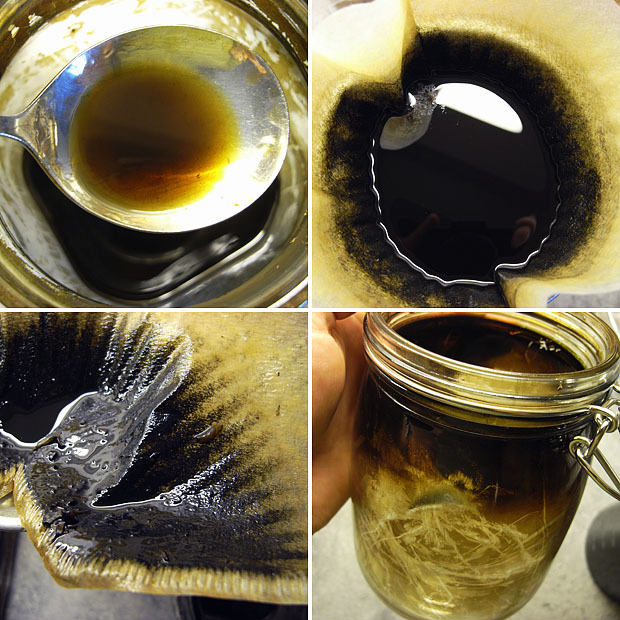 Precipitation in nocino extracted with 60% ethanol shown (upper left), filtering was slow (upper right) due to extensive clogging (lower left). A black film had also formed on the inside of the glass. 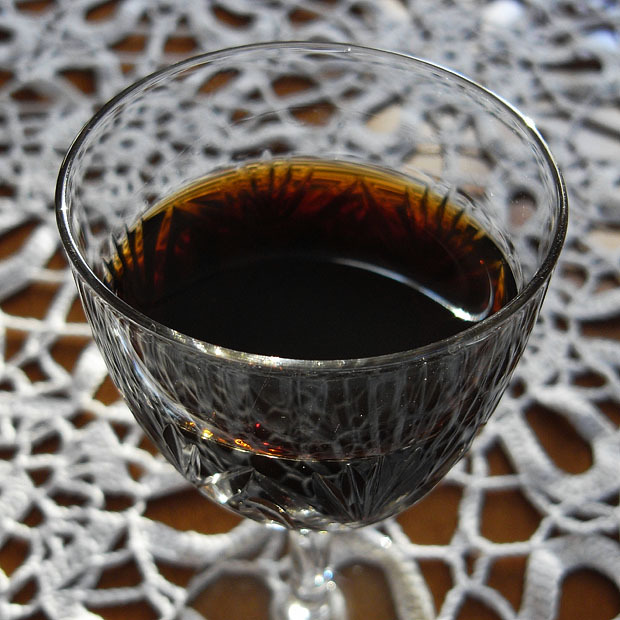 Nocino tastes marvellous, despite the motor oil like appearance during steeping! The difference between the two ethanol concentrations was less than I had expected. There was significantly more precipitation of black particles with the higher ethanol concentration. Both were however very drinkable! The only thing I might change the next time I attempt this is the amount of spices. I felt that the spices were perhaps a little too dominant and overpowered the walnut flavor, but the flavor was nice anyhow. Since I used walnuts that were a little too ripe it might be that less flavor was extracted, so I assume that my nocino is weaker compared to nocino made with the proper unripe walnuts. This might as well explain why the spices were a little too pronounced. Update: Reading Elise’s comment below I realized that there was one thing I forgot to mention. Since the walnuts were picked late I could neither cut them in half nor pierce them. After extraction I tried to cut a little into the soft shell under which the black walnut shell is barely visible. I’ve seen a recommendation to try nocino with strong cheese whereas others prefer it over vanilla ice cream. I’ve also come across two recipes for nocino ice cream so it’s a quite versatile liqueur! As we enter June, I am plotting my walnut collection now. Your recipe sounds great, but I’m not a huge fan of anise. In your final product, how pronounced is the anise? I think it would add a lot, but I don’t want it to overpower everything. My philosophy of Nocino has always been to highlight the bittersweet green walnut flavor. My method is to steep the nuts and alcohol for a couple months with the citrus peels, then remove the nuts and peels. At this point I sweeten with a spiced syrup and let it sit for at least a couple more months. I find it is too hard to control the level of spice when the spices are added to the initial infusion. All those strong flavored spices can be quite intense in an alcohol infusion. Also, it isn’t a horrible idea to skip sweetening until you have removed the bulk of the vegetable matter. You run a much lower risk of spoilage. Good to know that walnuts picked later in the season will still work for this, though you have to work harder to cut through the shells. I have one bottle left of our nocino that is now three years old and it is absolutely delicious. Am eyeing our walnut trees right now, thinking about making another batch. A little too early so far, expect there will be more walnuts to pick in a few weeks. Read your article on the chemistry of nocino, loved the shots showing what happens to it as it is exposed to air. Working with walnuts I discovered there is a reason “Walnut” is a furniture stain. I had always thought it was the color, but the stain really is from walnuts. They stain big time. Good thing to remember when making nocino. Wear dark clothes that you don’t care about. The liquid that comes out of the unripe walnuts when you cut them looks clear initially but turns dark brown and doesn’t come out. Elise: Reading your comment I realized I forgot to mention something – when making my nocino I wasn’t able to cut through them at all! I’ve added a picture of the nuts after extraction. However if they are soft enough I would certainly split the nuts to speed up the extraction. From experience and looking through recipes for schnaps and liqueur, 60% ethanol seems to me less common than 40%. I’m surprised that the higher concentration didn’t result in overextraction. I think 40% commonly goes for most spices, i.e. caraway, lingonberries, creowberries, blueberries, cherries, herbs/spices etc. Do you think the presence of sugar and herbs would affect the extraction? A recipe I’ve used for liqueur, the sugar is added after extraction; for lingonberry liqueur, the berries are decanted after extraction, sugar added to the residual berries and kept for another week for the sugar to “draw out” more of the ethanol/juice. This syrup is then added to the original, unsweetened, extract. Possible to adjust with more sugar afterwards. Chemgeek: what about making a rather concentrated anise extract with approx. the same alcohol content and add to taste. Then, there’s lower risk of getting too much. I’m about to make another batch of nocino and this time may make it with large peels of orange zest instead of lemon. I steeped my aromatics with the walnuts and didn’t think they were too strong – maybe the mellow with time? Thanks for your experimentation with two strengths of alcohol – now I know that it doesn’t matter much. In Prague my labmate was collecting walnuts for nocino in late May if I remember correctly, the peels were thick and shells soft like cork so they were very easy to cut through, I was helping with halving them and my hands got all brown. The initial alcohol macerate had a startlingly deep green color, he placed the jars with alcohol and walnut halves on the balcony to maximize the sunlight and temperature changes, and eventually the color turned deep brown and lots of precipitate crashed out. At the end of summer he filtered the liquid, added some sugar and proprietary herbs and spices and let it age some more: the product was finally presentable just before Christmas – it takes lots of time but it is worth it! Stumbled across your blog when searching for background info on walnuts and got caught up in it for ages. That food interest spiced up with your science background was an unusual and intriguing combination. 1 kg of nuts (33-35 nuts about depending on the size but always in odd number). The nuts must be strictly of local origin and without any treatment. They also must be, as tradition indicates, collected in the period at the feast of St. John the Baptist. 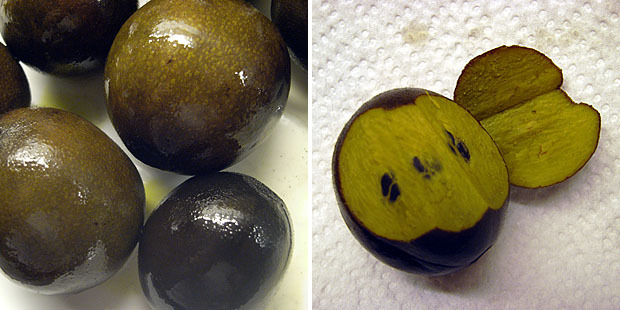 The right consistency of the nut must be assessed forandola with a pin and / or verified visually split in half with a knife. Cloves and cinnamon (a little is already a lot). and dosed in small quantities so that the flavor is still prevalent in the liquor that of walnut and the overall bouquet that you create harmonious result. The nuts, once collected, must be cut into 4 pieces and placed in a glass container (no rubber gaskets) with the sugar. After being kept in the sun for 1-2 days and mixed periodically, walnuts are ready to add the alcohol and any flavorings. The product thus obtained will be placed in a partially sunny, open and occasionally stirring, filtered, and not earlier than 60 days. It is advised that the bottling in glass containers dark and / or refine the product in small wooden barrels. You can choose either chestnut oak that provided the keg has been properly treated before use. The conservation of nocino must be done in a cool place for a minimum of 12 months if you want to fully appreciate all the organoleptic characteristics of this liquor. Just thought I would share the italian aspect of this great tradtional drink!